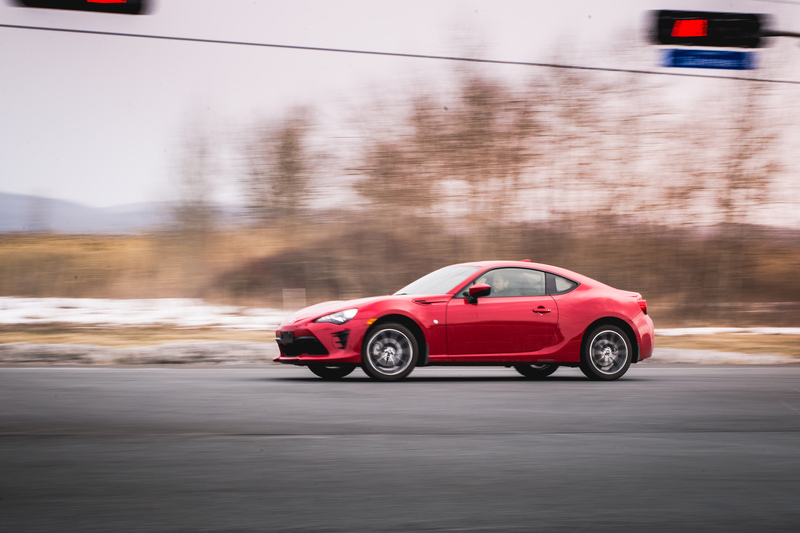 There are two ways to look at the Toyota 86 and its identical twin, the Subaru BRZ. You can either qualify them as unrefined, cramped, and impractical compact coupes, powered by an unreliable, misfiring, Subaru Boxer engine. You could fault them for their dashboard made out of the same plastics as your kid’s Buzz Lightyear, for having non-existing blind spots, no autonomous tech, and an infotainment system more primitive than the Pioneer head unit you bought for your Honda Civic back in 2002. But I prefer taking the other route when reviewing the Toyota 86. I prefer calling it the best automobile on the market today, simply because it’s exactly that: imperfect. And soon, very soon, we’ll all be sitting in self-driving boxes that will furiously beep at us for, ahem, driving them. The car world as we know it is about to change my friends. A lot. And many automotive enthusiasts aren’t ready for this. It scares us, and makes us feel an awkward apprehension in our stomach; but same as when a good friend announces you he’s transgender, I strongly recommend you start embracing this news. Accept it and prepare accordingly by buying a Toyobaru, and locking it inside a barn somewhere like the unicorn it will become. The breed of drivers’ cars is on the verge of extinction, and you’ll regret missing the boat once it’s headed out to sea. What do you guys want to know about this car that still hasn’t been said? Is it powerful? Not really. Is it fun? Hell yes. Can you daily drive it in winter? Sorta. Is it worth its (+/-) $30 000 price tag? Well, that depends on which one you choose. Actually, for 2017, the tables have been turned for the twins. When this car came out in 2013 under the Scion FR-S nameplate, it was actually less expensive than the Subaru version. Now, ever since a Toyota badge has been slapped on its hood, which, it must be said, makes a lot more sense this way, the price tag has also gone up. While the Subaru BRZ starts at $29 760, you’ll have to dish out an extra two grand for your identical 86. Does that answer your question? You might think the extra dough will give you a little something extra. Frankly, you’re not getting much. Except for added leatherette trim inserts in the doors and a smooth suede-like texture on the dashboard; this is the same insanely addictive car to drive as the Subaru. For 2017, there’s a now more aggressive front bumper with a lower intake grille that’s in tune with the rest of the Toyota lineup. LED headlights, taillights, and turn signals are now standard. There are revised wheels, and unlike the Subaru, the Toyota doesn’t come standard with a decklid rear spoiler. Otherwise, this is the classic, curvy, stubby, not too wide, not too narrow, Japanese sports car design we all love. It’s also worth mentioning how tiny the 86 is compared to modern compacts and crossovers. And that feels absolutely amazing. Essentially, what you need to know, is that both the Toyota 86 and the Subaru BRZ are pure bred, no compromise, rear-wheel-drive sports cars. These things don’t need to apologize for what they are, and are proof that you don’t need a hell of a lot of power to have a shitload of fun behind the wheel. 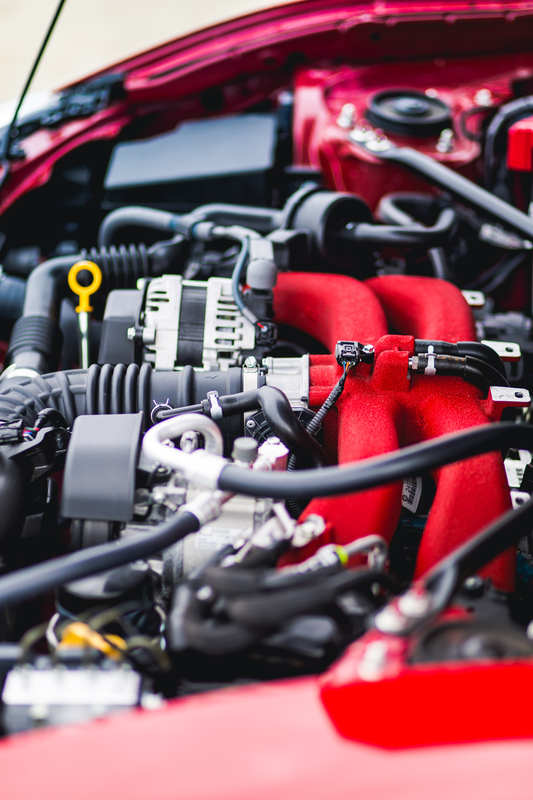 Under the hood of the Toyota 86 resides the same 2.0-litre, boxer flat four-cylinder as in the Subaru. For 2017, power has been slightly bumped by five horsepower (205), and five pounds feet of torque (156), but only for specimens equipped with a manual transmission. Take that, autonomous world. Other mechanical changes are minute, but significant in their own right. And very geeky. There’s a freer flowing intake and exhaust system, which are instantly heard and felt the moment you smash the accelerator pedal. The engine also gets beefier pistons, crankshaft bearings, as well as reduced valve train friction. Finally, the 6-speed manual gearbox gets a shorter final gear, from 4.30:1, to 4.10:1, requiring more frequent shifts to keep the engine within its 7 000 rpm power peak. And shift you will, as the 2.0-liter remains rather low on torque, with an awkward dead zone towards the center of the rev range, and a sudden, urgent rush of power when approaching redline. This is the most rev-happy flat-four I’ve ever driven. And everywhere you’ll go you’ll be ringing out this horizontally opposed engine to its limits, because it sounds absolutely fantastic at full revs. The engine is from Subaru, but Toyota has fitted its own intake manifold and fuel injection system. And you actually feel the engineering know-how of each carmaker as you’re putting this thing through its paces. Don’t even bother asking me if a baby seat fits in the rear seats, because it won’t. This is an anti-marriage car. Actually, the rear seats are merely there for decoration, or a human with no legs or head. 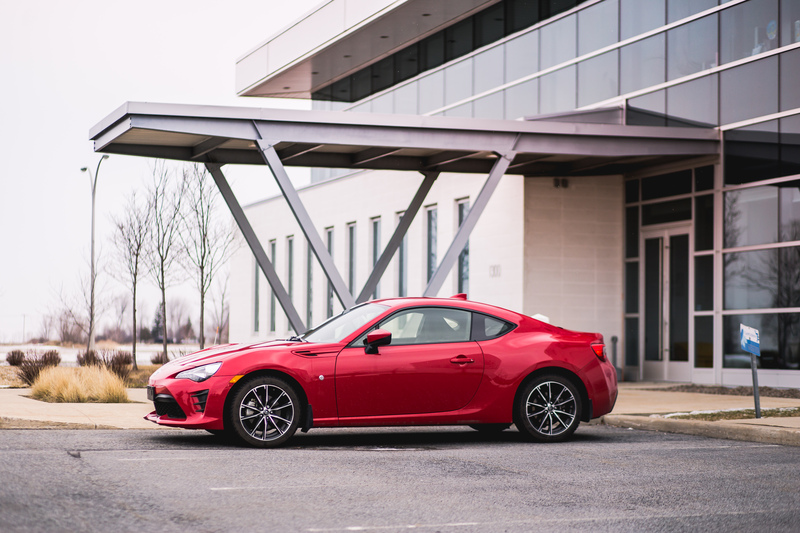 What you do get inside the 2017 Toyota 86 is a snug, driver-oriented, purposeful cabin. 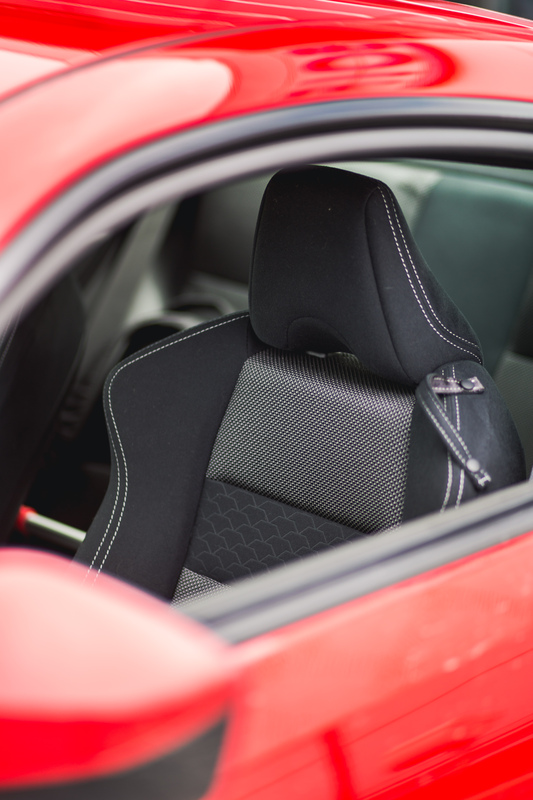 The sports bucket seats are supportive and offer plenty of lateral support. 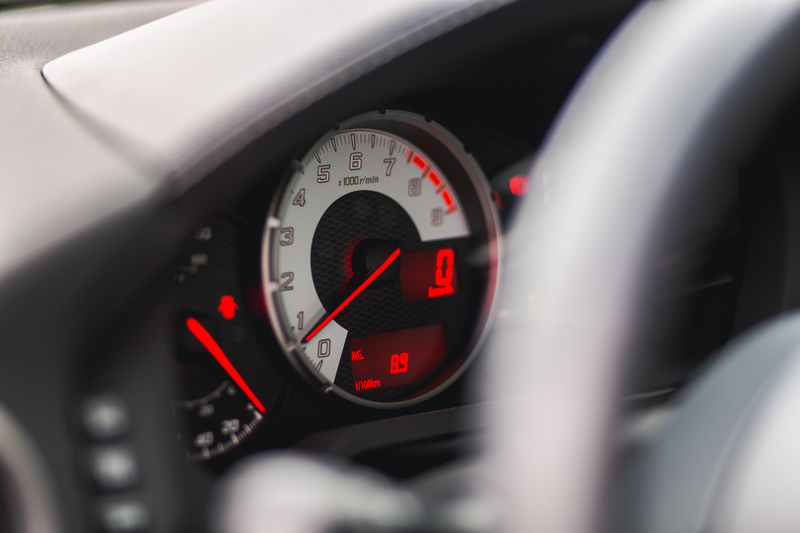 And the only kind of instrumentation available to the driver is a huge tachometer in the center of the gauge cluster, with a tiny speedometer tucked on the left-hand side. Speed is also presented digitally inside the tach like a motorcycle. 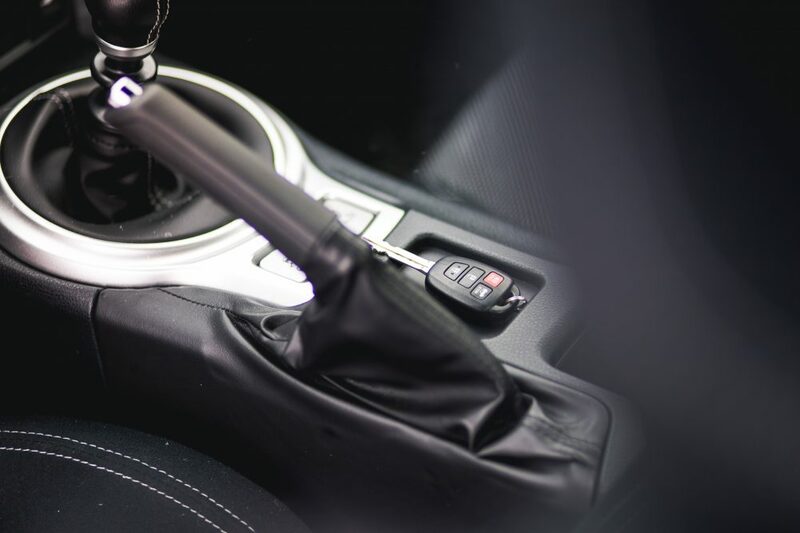 The 6-speed manual gearbox remains notchy, but throws are short and the shifter itself is perfectly placed to quickly grab another gear. Pedals are closely placed for heel-and-toe driving. The clutch is firm, with a high friction zone, and the steering wheel is of a small diameter for improved feedback and driver enjoyment. 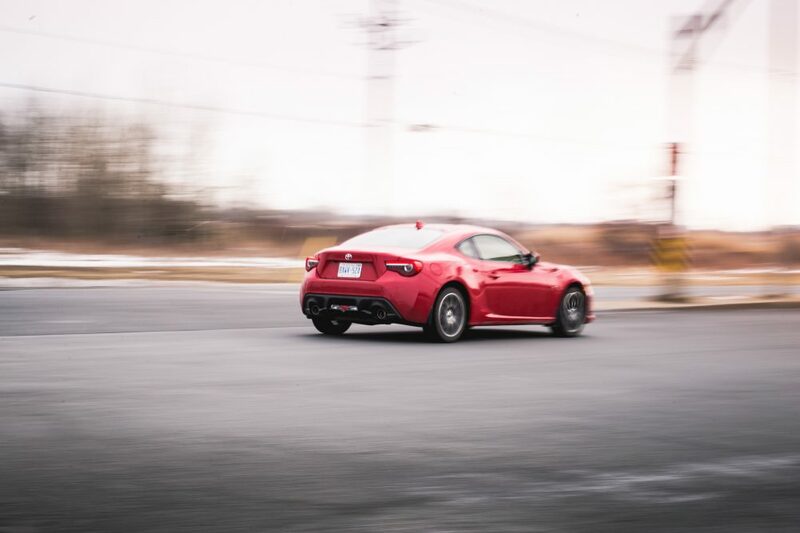 Take the Toyota 86 on a back road, and it’ll be one of the most communicative cars you’ll have ever driven. Thanks to narrow tires, there’s ample feedback going through the quick steering, so you know what the front wheels are doing at all times. The ride is stiff in this car, but still very bearable. And there’s very little overall sound insulation, so you always hear what the engine and transmission are doing. Everything transcends through the cabin, from the sound of the intake manifold that opens up when you give it some throttle, to the whining of the gears underneath the center console before it sends power to the rear wheels. 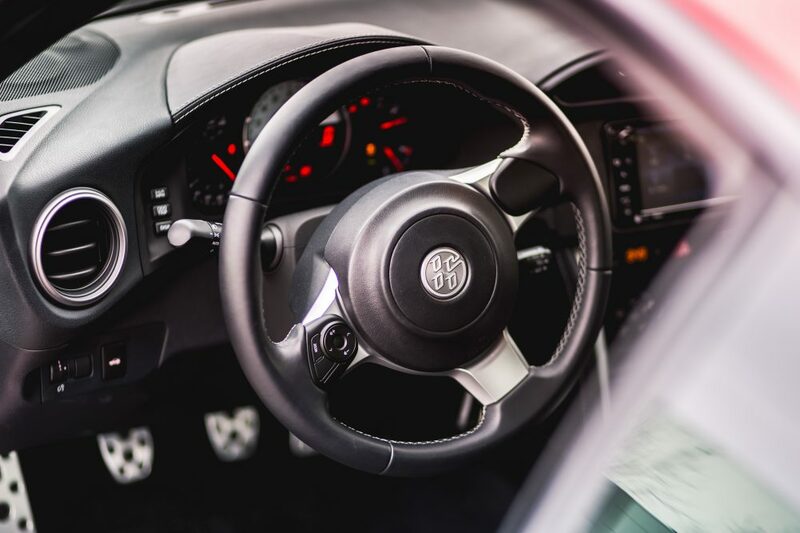 The Toyota 86 therefore represents the very essence of being in absolute control of a machine. Toyota and Subaru both claim having tuned the chassis to their own liking. From my experience, they both feel exactly the same behind the wheel. While I took the Subaru to a closed circuit to really see what it’s made of, I remained on the road with the Toyota. As with its mechanical twin, once traction control is completely turned off (but still remains somewhat on), you can easily fling this car into a perfectly controllable drift. Keep the revs high though, because the lack of power will cause the car to bog out easily while sideways. Toyota did stiffen up the front of the car, and softened the rear to allow easier oversteer manoeuvres. 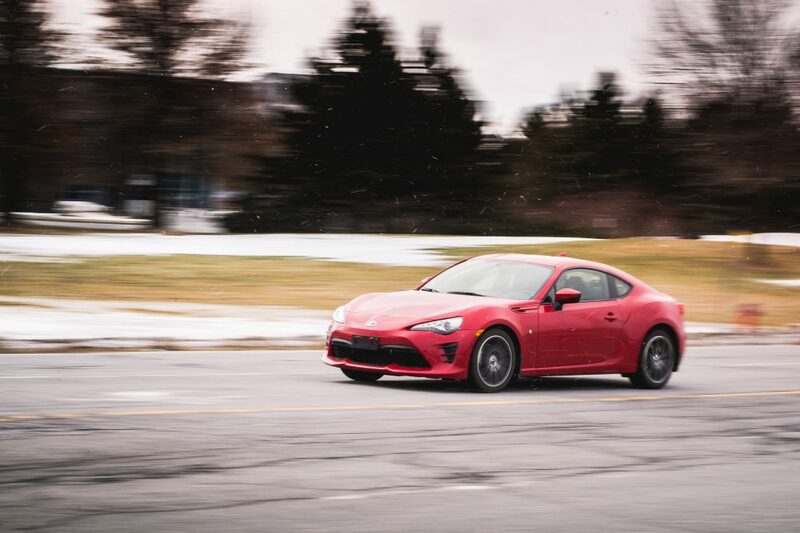 Pricing does remain the strongpoint of the Toyobaru twins, as there are very few cars available in this price bracket that can bring you this sort of thrill behind the wheel. As mentioned earlier, a base Toyota 86 will set you back $31 769. 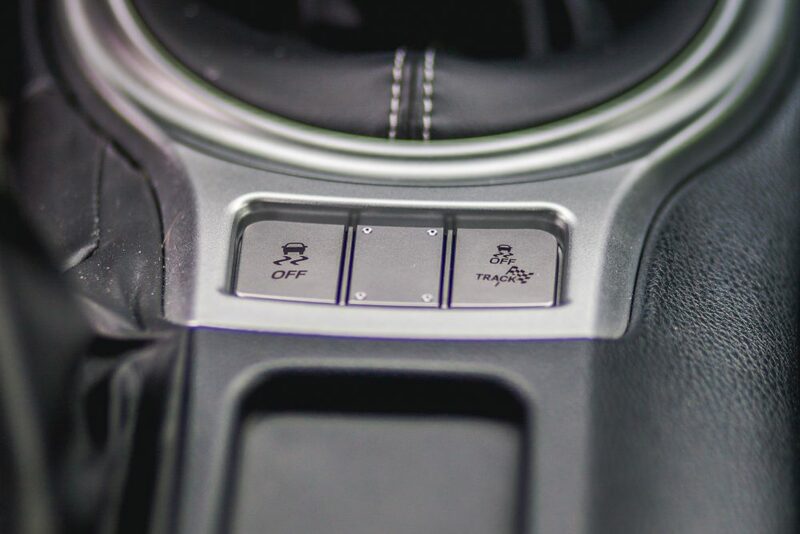 There’s a fully loaded 86 available, which apparently comes with leather, a push-button start, and other creature comforts. It sells for $32 969. But I’d recommend sticking to the base model, since what you’re essentially buying is a thrill-machine – not an appliance on wheels. So, who cares about leather seats? And if you were to ask me if this car is flawed, I would tell you that yes it is. Tremendously so. That boxer engine sounds broken on idle, especially when it’s cold, as if the valves were misaligned. 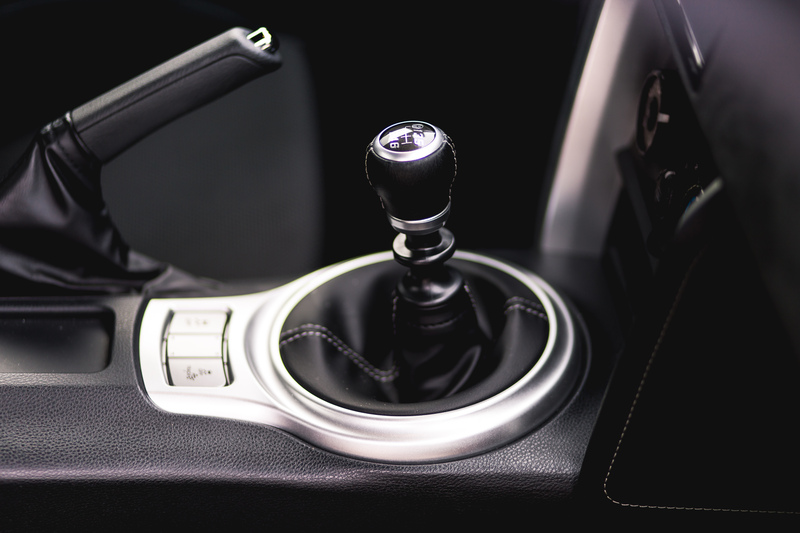 The shifter, it vibrates to the rumble of the engine, and the transmission emits a loud and worrying “clunk” each time you put it in first gear. 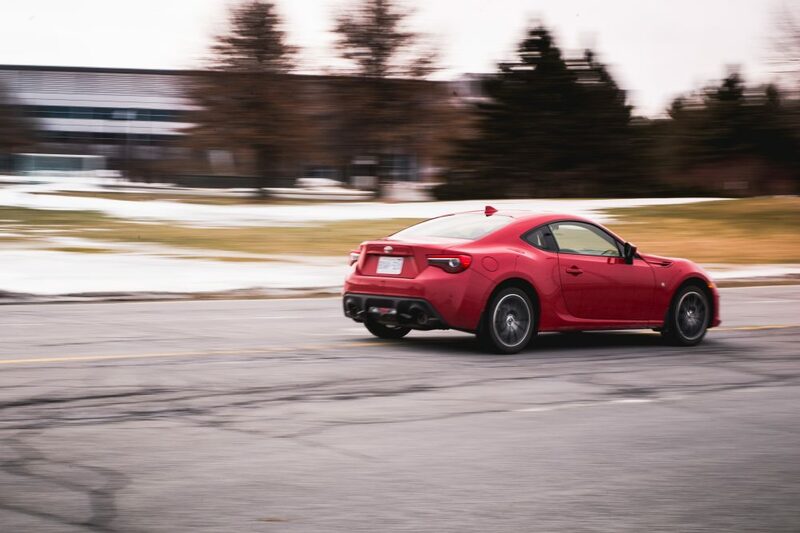 On slippery surfaces, like every single day during a Canadian winter, that rear end is always swaying around, and although us enthusiasts have nothing to say against an automobile that likes to play, it can become tiresome after a while. Unfortunately, the 86 doesn’t have a comfort mode. So you’re always fighting against the car under harsh climate. Finally, it’s really hard to see out of the damn thing. Outward visibility is limited, especially blind-spots. And the car doesn’t come with a blind spot monitor. But yeah, this is an otherwise perfect car! You’ve probably heard me complain before about how badge engineering heavily hurts a car’s identity. Vehicles like the Infiniti QX30 instantly come to mind, and end up being so corporately cynical that they exist solely for the purpose of generating more sales. Fortunately, Toyota and Subaru have used this cost-saving strategy to benefit consumers, instead of picking their pockets. The result is one of the most exciting products to have every come out of Japan, and proof that when two brands with entirely different values put their minds together to create what they believe to be the epitome of what a sports car should be, something extraordinary can be hatched. This the first time I’ve driven a press car I didn’t want to return, which is why I spent my entire week in the country-side looking for a barn, where the 86 will sleep for the next twenty years. When we’ll look back at it, we’ll regret all the awful automotive decisions we have taken. + Very fun and engaging to drive. + Affordable: both on purchase and to daily use. – Lack of low end torque. – Lower than average build quality. – Not the most practical car. Loved my 2013 until I had to give it up, the manual transmission was better than your review would indicate but the power delivery with that nasty hole in the middle was close to a deal breaker. Way better and so much more honest a car than my 2010 G37S Coupe 6MT, which I hated. 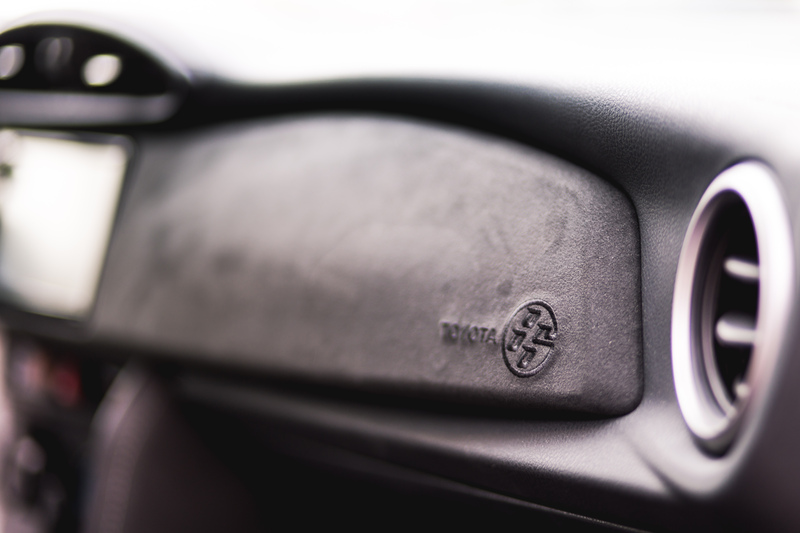 Build quality especially of the rust variety is a little worrying – mine had spots on the bar that separates the main door window from the little corner window near the a-pillar. But more practical over time than you might think – if you flipped down the backs of those truly useless seats at some point you would see enough room to stick my Cervelo road bike in once the front wheel was popped off for instance. Not the best in the winter, but I made do. And it wasn’t really suited to life as a 400 series highway commuter car, low, loud, and that lack of midrange. this is some decent automotive writing by golly..